I was there. And I'm still surprised. 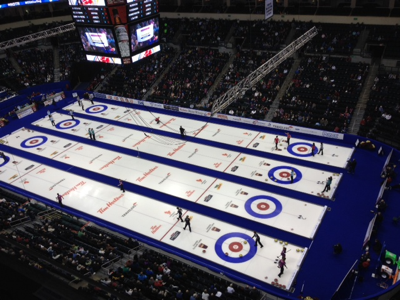 Not surprised that Jacobs won, I watched them at the Brier and you knew they had the talent and the fortitude. Mind you, so did everyone else in this mens field. I was surprised at how things transpired. Martin winning two games he had no business winning, then losing to Jacobs and Morris in games they likely should have won. Koe starting out 0-5 then taking away all play-off hopes from Howard and McEwen. 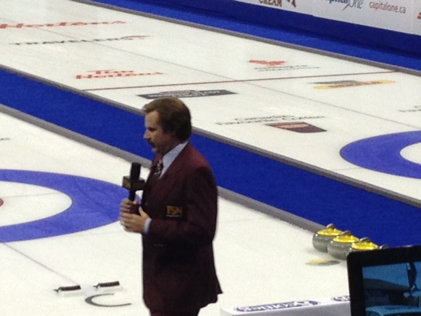 Calmly drawing the button against Howard same as he did in the 2010 Brier final. Koe is now 4-13 against Howard since the 2010/11 Season and 7-21 overall. Jennifer Jones winning was no real surprise. You could certainly say the two teams that looked strongest all week came through and will likely be great reps in Sochi. Who ever gets out of Northern Ontario this year better savour their Purple Hearts, they won't be available for many years to come. Assume the shot for 1 is made 100% (it isn't quite that high). Taking 1, Jacobs wins 89% of the time. Attempting a double, a few things might happen. There's a slight chance he still gets one, if either a red spins to go between the 2 yellows or removes the yellow at the back of rings. Let's assume that's 0%. Jacobs needs to make it about 50% of the time for it to make sense. Based on the margin for error for hitting a half rock, I'd say about every skip there could have called that shot and it would be correct. It was initially my guess that Morris wanted to him to try the double, as it created a chance to steal. Then he said on air "I didn't think he'd try it". I actually believe you want him to try it but the rock could have been put further away to be more difficult. If Jacobs takes 1, you're still losing 89% of the time (and that's against the average team, possibly even worse against Jacobs). You want to create some type of scenario where you might possibly steal, even if it creates a risk at losing now. The better option may have been to try a partial guard/come around on the yellow in the top twelve. 2. How did Howard give up 4 in the 8th end, when 3 up against Martin? Laing missed a peel and Glenn missed both his shots. So how could they have avoided four (a 40% Win Expectancy) and simply held Martin to 3 (a 78% WE)? - One suggestion early in the end was Linda and Russ mentioning NOT to put two rocks in the rings with lead rocks. Many teams will put first shot top four foot and throw the second through rather than come in and give more "shrapnel" as Russ called it for the other team to use. This did hurt them as the peel into the pile pushed their rock to the back twelve which was then frozen to by Kennedy. I agree, if you're 3 up (of even 2 up) more than 1 rock in the four foot can hurt you more often than it helps. I don't have data to support this but I've always felt this way. Anyone remember Ferbey vs Dacey final end of the 2004 Brier? - Glenn's last shot. Surprising that they discussed and didn't realize that throwing more weight would clear out the rocks. Glenn was so focused on putting his shooter into a certain spot with a certain roll that they failed to notice that lighter weight and a miss by 2 inches would leave a shot for four. If Glenn could throw it over again I suspect he throws more weight and makes sure of no worse than 3. After he played the shot the camera caught him putting his head in his hand and whispering "Oh, Christ". At that point, even divine intervention wasn't going to help them avoid a catastrophe, only a deuce in 10 could. - Glenn had a difficult shot for 2 in 10 but it still appeared to be the correct call. remember he needs to make it only 1 in 5 tries to be the same as going to the extra end. - TSN turning point - perhaps not even the 9th end but the last shot in the 8th when Glenn had a very makeable shot for 2 that would have put them up 4, and he wrecked on the front guard for only 1. - Glenn later said it was the "worst loss of his life". It's not the biggest loss in the biggest moment as a skip (I think the loss to Menard in 2006 finals was most shocking perhaps), but with it being the Trials and the way it happened, likely one that will linger for a long time. In curling, these types of things just aren't suppose to happen, yet every player, even the best in the world, has a memory of a game like this. 3. Matt Dunstone and his Canadian Champion junior team was introduced to the crowd on Saturday during the 5th end break of the Semi-final. They showed some great highlights on the jumbo-tron, but missed the most important one, this Manitoba curling commercial from the mid-80s starring his dad Dean Dunstone. Matt naturally isn't visible in the video, but you can see the glint in Dean's eye. You can also see that most hairdressers in the 80s had a cocaine addiction. 4. Mens Semi-final. 6th End. It seemed like Kevin hit the in-between shot exactly. Leaving his shooter in a terrible spot was the big mistake. The nose on his blank attempt in 9 was interesting because of John's thoughts on where to put the rock. No one was perhaps better suited to decide where Kevin would be most likely to bonk than his previous third. Still a rare event and not expected. Unfortunate result for Martin who had played as well or better than any player all week but was off on a couple of shots in this game. Interviews begin with skip Kevin Martin, second Marc Kennedy and lead Ben Hebert. Then follows fourth Jim Cotter and skip John Morris. Around The House will have all the recorded interviews in the media scrum following the Play-off games of the 2013 Roar of the Rings, Canadian Olympic Curling Trials. Rachel Homan is first, followed by Sherry Middaugh. Epping, Howard, Stoughton and Koe are all out. They may all be in the patch tonight, getting prepared for the morning draw. Only Koe needs to "take it easy" as his game against Mike McEwen has ramifications for possible play-offs. In 2009 I'm certain the final draw was Thursday night which made that night in the Patch one of the best ever. All but three mens teams were done and having a grand ole time that night. Now, half the field would rather enjoy the evenning without having to rise and shine to play a game they would prefer to skip (I mean "skip", not skip). IF Martin wins against Morris, he gets hammer in the semi-final. IF Morris loses that same game against his old skip, he will have to see what Mike McEwen does in his game against Kevin Koe. IF McEwen wins, he's in a tie-breaker IF Morris loses. IF Morris wins, McEwen is out and Morris has hammer in a re-match against Martin. IF Epping wins against Brad Jacobs, Epping will increase his stats in wins and losses, and Brad will not be the least bit disappointed. And in the battle of the two oldest skips, in a game we all expected would matter, IF Jeff or Glenn win they get absolutely nothing. 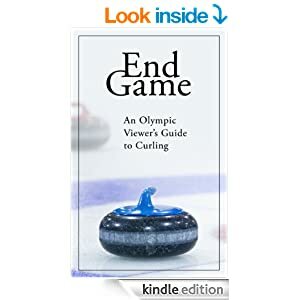 It seems so strange that the TV game will NOT be the two best skips in the last 7 years (and pretty darn high on the list of greatest curlers even before that) not named Kevin Martin. Odds that Jacobs goes to Sochi (58%). They've looked strong all week and will be difficult to beat, especially with hammer (although they didn't need it last winter at the Brier or Worlds, until the final game). Good luck to all and please, for those who need it, get some rest. You have a big game tomorrow. There are many sayings about home and that once you leave you can't go again, or things change, or it's where the heart is, or something like that. My home has been Alberta for 13 years and I was actually born in Montreal but my formative years were spent in the great city of Winnipeg, the "Paris of Canada" as Ron Burgundy put it earlier this week. Day 1 included 13 hours of visiting old friends, their growing kids, and consuming several good beers, fine wines and a scotchy scotch for a nightcap (or two). 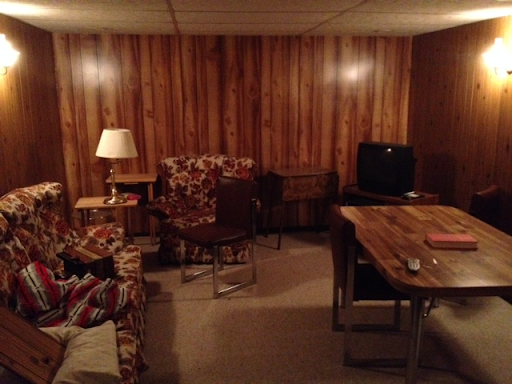 It also included a brief glimpse at the childhood basement of a curling friend, where much of my teen years were spent frolicing and listening to the smooth sounds of Collective Soul, Beastie Boys, Pink Floyd and Paula Abdul (yes, Ken's tastes were "straight up" eclectic). How did we fit 128 people into that room? On Day 1 of the Roar/Trials I ran into several people I had not seen in many years. It amazed me how good they all looked and how, despite age and changes, Winnipeg seems to stay the same. Maybe when the city's own band The Watchmen wrote Any Day Now it was as much about how the feeling of being back in Manitoba's capital takes you to yesterday and makes it feel familiar, as do the old friends and good company, even if everyone is 30 pounds heavier, battling hair loss and raising 2.3 kids. Many great conversations about the Trials, kids, and who got cancer. On Day 2 the nostalgia came back harder still when I met Rick Loewen, of The 2 Sports Guys. These guys ran a local cable access show while I was in University and they were brilliant. I even went to watch local tapings (usually along with 7 or 8 other rabid fans). I immediately texted a friend (from Winnipeg) who asked me to remind Rick he still owes him an ugly lamp as a trivia prize. Frightened of another potential 2 Sports Guy Nerd stalker, Rick made a quick getaway. 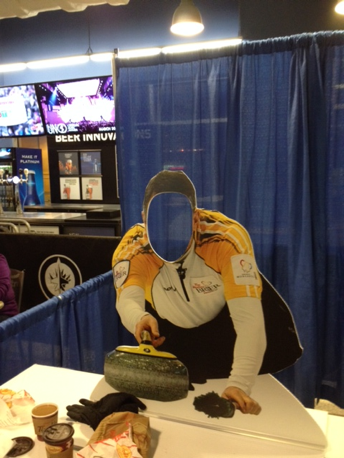 Winnipeg is also home to many of the curlers here this week. 17 of the 64 starting players are Manitobans of one flavour or another, and that doesn't include Jon Mead who was born in Saskatchewan but grew up in Winnipeg. Six of the 8 mens teams has at least one Manitoban. Dave Nedohin is a returnee who had all of his notable success in Alberta playing for the rival of his now skip, Kevin Martin. Martin is off to a miraculous 5-0 start that could easily be 3-2. Two wins on Tuesday appeared out of nowhere when Kevin Koe, in command at 4-2 with hammer playing 8, coughed up a steal of two, was forced to a single and then surrendered a deuce in 10 to lose. His average Win Expectancy was 94.5% starting the 8th end. Koe has fallen to 0-5 and they seem to be the snakebit team of the week. Very close games, many that could have gone either way, but they landed on the wrong end of the scoreboard each time. Martin had another miracle comback, this time taking 4 in the 9th end against Howard when they were 3 points down. I'm still so struck by it I can't really remember how it all developed. I hope to review the end as soon as I get my hands on a "PVR recording" (which still feels stranger to me than saying that than Beta VHS). Howard still had a chance, down one with hammer, but attempted a double raise for two. Some thought he should have tried an angle tap for one but the raise seemed very make-able and he may still get one very often even if he doesn't score two. Likely the right call. Howard's odds to win starting the 9th end, 95.8%. Martins odds of pulling of Both miraculous wins was roughly .23 % or less than 1/4 percent. Ouch. The draw to the button continues to be an exciting event that they should put on TV. At 0-2, Stoughton came out against Epping and following their first practice, the first 3 players covered the pin. Lead Mark Nichols then put it on the button, and hi-fives all around. Jennifer Jones felt some nerves on her first draw for the hammer (which have clearly subsided as she sits 5-1). On Sunday afternoon in front of a large Burgandy charged crowd she was called for a hogline violation. This could have had major implications as tie breakers at the end of the week rank teams based on head to head wins first and then total hammer draws for the week. I learned that a hog counts the same as missing the house but teams only use 6 of their 7 draws towards the ranking, so they can toss that one out. Phew. Other early nerves seen from nearly everyone. Homan had a hit for three against Val Sweeting during the 2nd end in the first draw, and gave up a steal of one. That game launched the Sweeting team to a hot 3-0 start, but they have now regressed to 3-3 and need a win tomorrow to ensure a play-off or tie-breaker. On the Womens side, Jones has clinched #1 and a bye into the finals with her steal in the 10th end against Homan, who drops to 3-3. Jones will have a chance to move Nedohin to 3-4 tomorrow and possibly keep her out of the weekend, but maybe not. If a 3-3 team wins they are assured of a chance, and that's all anyone can hope for in this grueling event. 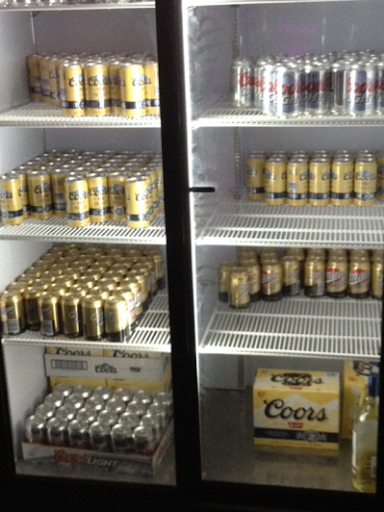 Coors, Coors Light and MGD? Where's my Old Style Pilsner? Jordan Bauldic, Kevin Palmer and guest Kyle Jahns, freelance writer for the CCA, record their first ATH of the season LIVE from the MTS Centre in Winnipeg right before Draw 7 of the Roar of the Rings, Canada's Olympic Curling Trials.